When it comes to a discussion of hygiene, one subject that needs to be discussed is shaving. Now having a beard does not make you dirty or less hygienic as long as you wash it regularly. But there may come a time when for injuries, skin infections or other medical problems you may need to shave. You may at some point want to shave to change your appearance or to fit in better. What provisions do you have in your preps when it comes to shaving? 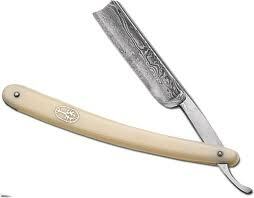 The cheapest is to learn to use an old fashion straight razor. Now this takes a bit of skill and kind of scares me. I decided to stock what I think is the second cheapest method. 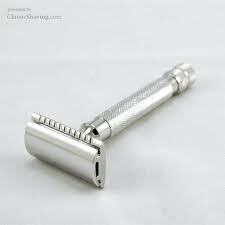 An old fashion safety razor and blades is my choice. With a little research on the internet, I found packages of 100 safety razor blades for under $30.00. Now with a little care a package should let you shave for a year. While this is not the most important of preps, it may be one that you will be glad to have. Medicinal Plants, Learn how to Use Them. Alternative Medicines, Do They Work? This entry was posted in medical, Sanitation and tagged Howard, safety razor, shaving. Bookmark the permalink. To shave or not to shave mostly depends upon cold weather comfort, whether you need a snug fit for breathing apparatus or PPE to work properly, or if you are trying to “blend in” with the natives. Back in the day before people understood proper sanitation, shaving cuts were a dangerous source of infection. Hence the safety razor, which was developed for use by troops during the First World War so that gas masks would fit properly. As for me, unless I am evading within community of lumberjacks or hippies, I’m with Howard on keeping Dad’s old WWII-era Gillette and several packs of blades just for nostalgia’s sake. A aroma from a splash of Barbasol or Bay Rum early in the morning, even before coffee, is reassuring and means that everything is still right with the world. I’ve recently been saving my disposable razors when they get a bit too dull to use; not sure if this is the brightest idea but if times get tough at least I have something to fall back on. Safety razors are certainly a good choice, and when they are too dull to shave with you still have a relatively sharp throwaway utility blade. Several taped together can be useful for all sorts of things. However, don’t just throw these in your preparedness kit and not use them. Although quite good, there is a learning curve in comparison to common disposables, and an emergency situation is not the time for added cuts and scrapes. I gave up my mutli-bladed razor 3 years ago, when I saw that my wife was paying $24 for 8 refill blades. Bought a merkur adjustable safety razor and a badger hair shaving brush. Its the best shave I have ever had. Most men make the mistake of trying to get all the hair in the first pass. Shave a little, re-lather, shave some more. Now I spend $1.80 every 10 weeks(from the big W) and $2 for shaving soap every 2-3 months. And there is a years worth of blades and soap in the medicine cabinet. A helpful article for those men looking to make the switch.